General Sherman said war is hell. Marvin Gaye said war is not the answer. NAM-1975 says war is tedious and impossible. And not very much fun, either. 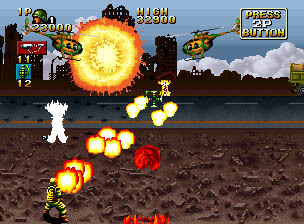 Taking more than a few cues from films like Apocalypse Now and Full Metal Jacket, the very first Neo-Geo game ever puts you behind the back of a soldier on a dangerous mission to Vietnam. It's target shooting, pure and simple, interrupted by a few cinematic sequences with voice-overs. The goal: Kill 'em all and let God sort 'em out. 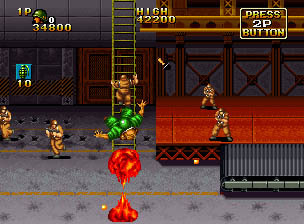 You're armed with a never-empty, upgradable machine gun, a limited number of hand grenades, and an evasion move that lets you either run fast or do a sassy cartwheel (it's rarely as fast or effective as you would like it to be). While you're running, you won't be gunning and vice versa, setting up some frustrating moments; you'll feel like you're running from every firefight, but if you stay and return fire, you're doomed. It doesn't help that the enemy's bullets are tiny, fast, and hard to see. You may find yourself fighting with and cursing at the joystick all the way through. 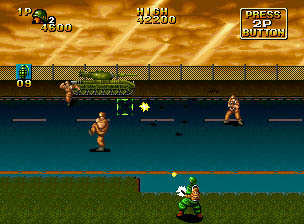 There isn't much to see here: a few cut scenes, lots of rubber-stamped soldiers, and a wee bit of scrolling (the clouds on the airplane level do pop out at you compared to everything else in the game). 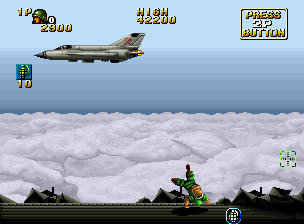 Not-too-detailed enemies appear on different planes on the horizon and sometimes airplanes fly toward or away from the screen, but that's about it. There's no slowdown but there's not much on the screen to get tangled up, either. It is amusing, however, that everybody throws grenades like baseballs, complete with a wind-up motion that belongs on a mound. You'd think you were fighting the Vietnam Dodgers. Fairly clear (if not terribly impassioned) speech samples are the sonic highlight for this game; the music is rather rudimentary. It tries to be dramatic and stirring but comes off like the mediocre MIDI it is. The boss music for level 1 sounds like something Mark Mothersbaugh threw away as a failed Devo experiment. 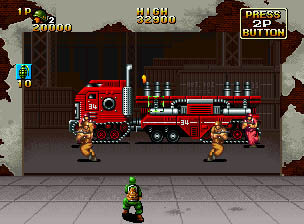 You'll have no choice but to replay this game--after all, three men can and will die in roughly 10 seconds, maybe less if you're not paying full attention. 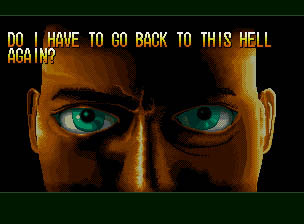 The sky-high difficulty and one-trick gameplay will wear on you pretty quickly; it's hard to make it into the fourth stage without realizing how annoying the whole thing is. 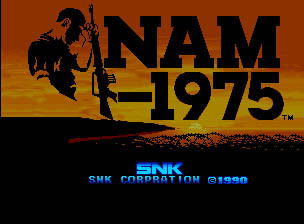 As the very first Neo-Geo game ever, NAM-1975 deserves a certain amount of leeway--but still, as something you'd supposedly want to shove quarters into, the game really shows its age. 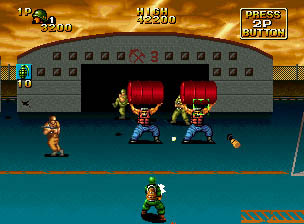 The limited gameplay combined with crushing difficulty kills the fun. Think of it as Apocalypse Then--respect it as history, but don't doom yourself to repeat it.